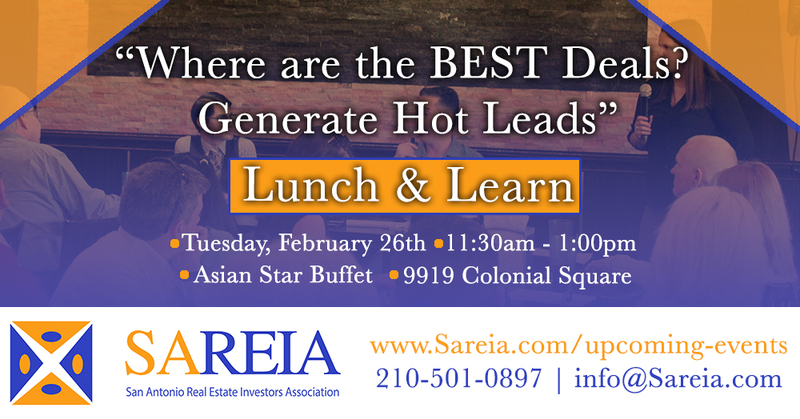 San Antonio Real Estate Investors Association - Lunch & Learn- "Where Are The BEST Deals? : Generate Hot Leads"
Lunch & Learn- "Where Are The BEST Deals? : Generate Hot Leads"
Real Estate attorney, investor, broker and president of SAREIA, Victor Maas, has been investing in Real Estate over 15 years. In addition, Victor has closed 100's of transactions ranging from Sub-2 deeds to full blown rehabs. Please join us for lunch as we discuss how to generate more leads that are actually worth pursuing. Stop wasting time chasing after skinny deals that won't get you a big payday. Go after deals in areas that are turning a big profit!